Is Your Truck Ready For Winter? For those in warmer climates, you don’t need to worry about prepping your truck for the winter months. (Although considering last year’s surprising snowfall in Florida and Texas, you might want to consider it). But for those in cold-weather states, you know that prepping your truck for the winter road is not only crucial but literally life-saving. So even if you’ve lived through many winters, consider the following tips to remind yourself how you can stay safe on the road and keep your truck in good condition this winter. Make sure your truck bed is secure. Roads are slippery enough in winter. The last thing you want is dangerous debris flying around. 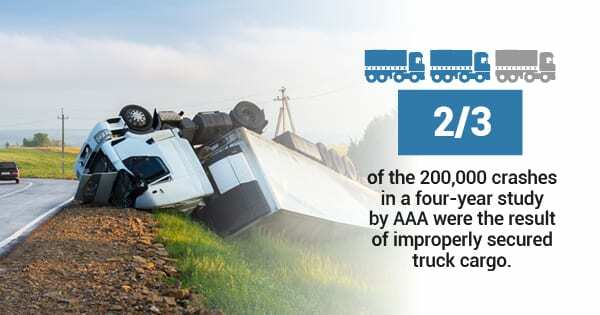 In fact, two-thirds of the 200,000 vehicle crashes that occurred over the course of a four-year AAA study were caused by improperly secured truck cargo. Pickup truck tie downs can help keep your load secure. Prepare an emergency kit. Emergencies happen when you least expect them, which is why it’s best to be prepared. Keep an emergency kit with a blanket, extra gloves, and other materials like a bag of abrasive material on hand (sand or cat litter can help create traction in the snow). Switch over to snow tires. Not every car needs snow tires, but if you live in an area that’s known for getting more than an inch of snow it may be a good idea to give yourself some extra traction on the road. Check your 4WD system. Four-wheel drive can come in handy during the winter months. If you have 4WD, make sure that it’s working correctly (especially if you don’t use it during the winter months). The system ought to engage and disengage easily. Know what to do if you get stranded. If you get stranded somewhere you don’t know, don’t get out of your truck to walk. Hypothermia can hit fast when you’re outside. Instead, light two road flares on either side of your truck to let passing people know you need help. Keep the window open a crack and turn on the engine for 10 minutes each hour you’re waiting for help. Where can I find pickup truck tie downs? Up to 39,000 people were injured and 500 people killed by dangerous debris over a four-year period. Pickup truck tie downs and truck tie down anchors can help keep your materials safe and secure in the bed of your truck. Whether you’re looking for truck tie down straps or stake pocket tie downs, Bull Ring has what you need to secure your load. To learn more about our truck tie downs, contact Bull Ring today.